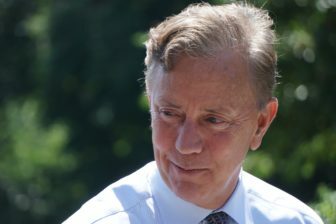 Democrat Ned Lamont has come down hard on his GOP rival for proposing unprecedented tax relief with no plan to pay for it. But Wednesday, Lamont made a similar move when he unveiled a jobs plan centered on three business tax cuts — and a previously disclosed middle-class income tax break — none of which he could provide without solving a much-larger state budget deficit. And so far, neither Lamont nor Republican nominee Bob Stefanowski have disclosed how they would solve that $2 billion problem. Lamont already has proposed expanding — over three years — the $200 state income tax credit that offsets a portion of middle-income households’ local property tax burdens. The base credit would grow from $200 to $300 while a “targeted relief” program for 315,000 of the poorest households would provide an average benefit of nearly $700. Eliminating the $250 business entity tax imposed every two years on many limited liability partnerships and corporations, as well as other small businesses that aren’t subject to the state’s corporation tax. Exempting businesses with less than $10,000 in taxable personal property from municipal property taxation. Reducing the state’s capital stock tax, also known as the capital base component of the corporation tax, which is a levy on a business’s net worth or capital holdings. Connecticut imposes the nation’s highest rate at 0.31 percent. Lamont doesn’t say how much he would lower the rate, or how he would pay for this tax cut. Connecticut is one of 16 states with a capital stock tax and one of just three — along with Massachusetts and New York — that does so as part of a larger corporation tax. Companies pay a corporation tax based on either the capital stock calculation, or a more traditional formula based on the company’s net income, whichever is higher. A state tax study panel recommended eliminating the capital stock tax in 2015, but also suggested raising the traditional corporation tax rate to ensure the state loses no revenue overall. But Lamont also has repeatedly pledged to deliver an “honestly balanced budget” — something that will be increasingly difficult to achieve in Connecticut over the next decade-and-a-half. Surging retirement benefit and other debt costs, as well as an economic recovery that has lagged behind the nation’s, have left state analysts seeing red. State finances, unless adjusted, are on pace to run $2 billion in deficit in the first fiscal year after the election. And the potential gap grows by more than $500 million in each of the three fiscal years after that. Lamont’s income tax relief plan involving the property tax credit would cost $400 million per year, and he says he will cover that cost with savings in the prison system, better tax collection enforcement, and imposing fees on sports betting. His new plan doesn’t say how he would replace the $40 million produced biennially by the business entity tax — or about $20 million per year. In addition, cities and towns would lose $6 million annually through Lamont’s plan to exempt a portion of business property from local taxation. The Lamont campaign says it would make communities whole, but offers no details. Joe Delong, executive director of the Connecticut Conference of Municipalities, said communities aren’t opposed to working with the state to bolster the economy. Can Lamont sustain more than $420 million in annual state tax relief without closing a $2 billion hole in state finances, or addressing more red ink on the fiscal horizon? Neither he nor Stefanowski have delivered a blueprint to solve that $2 billion problem. Stefanowski’s tax relief promise is far bigger — to phase out the state income tax over eight years. The tax generates $9.7 billion, or 51 percent of this fiscal year’s General Fund. The second-largest levy, the sales tax, generates $4.2 billion — which doesn’t even cover all of the state’s retirement benefit and debt costs. Lamont calls his opponant’s phase-out pledge fiscal fiction. Stefanowski has offered no specifics on how he would rebalance state finances without an income tax. He has said he would find the savings by reducing the state workforce and by reorganizing agencies — despite existing contracts that exempt most unionized employees from layoffs until mid-2021. 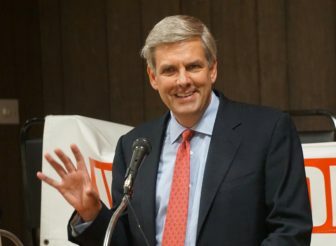 “I will rip costs out of the state budget like you have never seen in your life,” Stefanowski said during an Aug. 6 debate at Fairfield University. The jobs growth initiative is a sprawling plan that offers a re-statement of Democratic goals, such as raising the minimum wage to $15, establishing a system of paid family and medical leave, and closing the wage gap between men and women. Without indicating a cost or means of funding, he endorses some potential big-ticket items. He would expand the state’s technical high school system and UConn’s city campuses, replicate the quasi-public Capital Regional Development Agency in other regions, and expand public transportation networks. Mixed in with the broad and sweeping ideas were the small and specific, such as a commitment to “outfit school buses with wifi so students facing long rides can reclaim hours of lost study time,” and a pledge to offer reduced-price museum admissions to SNAP recipients. Elements of his plan echo concerns raised by others about economic development, as well as the criticism he recently directed at Gov. Dannel P. Malloy’s “First Five” program, which provided loans and grants to companies able to promise creating at least 200 new jobs. The Department of Economic and Community Development already is subject to audits, and DECD currently monitors the job creation by recipients of economic aid.